As a custom equipment builder for the printing industry, Innotech offers a wide range of equipment to add value to the printed products. One or more of the following units can be added to the web printing press or can be arranged in a finishing line at the of the press. PATTERN GLUE UNIT applies finely metered glue, coating solution on scratch off coatings to web. The units include 360º motorized circumferential register and are available in various configurations. The units can be supplied with segmented glue pans and are available with quick change over cassettes for multi repeat presses. PATTERN PERF UNIT applies perforation to the web using litho perf tape. 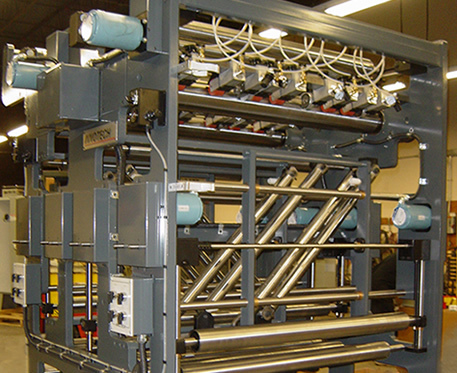 The plate cylinders are customized to use same plate as the press. Features include 360º motorized circumferential register as well as on the run depth of perf adjustment. DIE CUTTER UNIT is available for use with etched steel plate dies mounted on a magnetic plate cylinder. The unit includes a hardened anvil cylinder. The cylinders are mounted in preloaded tapered roller bearings with precise adjustment of pressure between cylinders in increments of .0001. RIBBON DECKS are custom configured to slit web into multiple ribbons and realign the ribbons including the ability to reverse ribbons. Motorized movement of angle bars and compensators with position indictors for each enable quick make ready. Plow towers can make running folds in the web or ribbons. GAP-CUTTING ROTARY CUTTER enables cutting and bleed trimming folded products using patented vacuum cutter-head to pull through the center of cylinder.